Arriving at our Luzhou Airport. The airplane taxies right up to the building and off we go! One of the highlights of this last trip to America was flying from and into our little Luzhou Airport. I have never done this before in all my years working here, although taking off directly to Shanghai would have been a lot easier than traveling the 3 ½ hours to Chengdu. The reason I always left from Sichuan’s capital city was because Little Flower’s sitter was located there. I’d go by bus, drop her off with Mrs. He and then take off the next day on my journeys to the States from Chengdu’s International Airport. But this time around, I had no need to travel to Chengdu with no Little Flower to care for. This time around, it was conveniently load my luggage in a taxi, pay the driver 50 yuan ($9) and in 15 minutes, I was outside of the city, in the middle of farmland, at a sweet little airport with limited departures and destinations. The history of this air transportation service is amazing. The runway was built solely and painstakingly by Chinese hands in the very late 1930s, the first real runway in China that was not dirt and pebbles. It was specifically crafted with American backing for modern aircraft, and was later used specifically by the Flying Tigers whose planes were not able to land on such tough terrain as it destroyed the wheels of their aircraft. “The 1st American Volunteer Group (AVG) of the Chinese Air Force in 1941–1942, nicknamed the Flying Tigers, was composed of pilots from the United States Army, Navy, and Marine Corps, recruited under presidential authority and commanded by Claire Lee Chennault. The ground crew and headquarters staff were likewise mostly recruited from the U.S. military, along with some civilians. This airport has a more personal connection to me because I actually know the daughter (Jean Woo) of the Chinese engineer who worked closely with the Americans to create this runway. Jean Woo and her husband, Rev. Franklin Woo, are Presbyterians who worked many years with the NCC (National Council of Churches) as the China experts. Before their retirement, the U.S. part of Amity orientations were led by the two of them. Jean’s father, a native to the country, was sent to Luzhou as the head Chinese engineer of this runway project. Believe it or not, I do believe he is still alive! Over 100 and now living in the States. I have bits and pieces of the story, as told to me by Jean from her father’s memoirs. The building was done by hand, including hauling rocks from the Yangtze which had to be crushed to make the foundation of the runway. Assembly lines were made from the distant river to the airport, and buckets of rock were passed along or carried by single haulers to where the heavy stones were needed. Huge, concrete rollers that weighed over a ton were used to smooth over the runway layers. These were pushed by the Chinese laborers. According to Jean’s reports, several died on many occasions when the rollers accidentally ran over them. The conditions of the camp were a problem. Many hundreds died of sickness due to sanitation and just close quarters. Disease spread quickly. This was something Jean’s father had to deal with as the Chinese overseer of the project. I wish I had more details to share. Jean can easily fill in the gaps. I will have to contact her to receive more information. I do know that Jean and Franklin visited Luzhou over 5 years ago when I was still here. They came during an Amity Foundation anniversary celebration, with a group of interdenominational guests, to visit Amity’s many social service projects in Sichuan. When the city officials learned who Jean was, the grand-daughter of the chief engineer responsible for building the runway, the two were treated as honored guests. They received an impressive VIP banquet by the Luzhou mayor and then a private tour of the current airport. It was the highlight of their first trip to Luzhou, which will probably be their last. They are in their upper 80s now and it’s getting more difficult for them to travel overseas. How wonderful that they were finally able to see the incredible results of Jean’s father’s work after so many years. 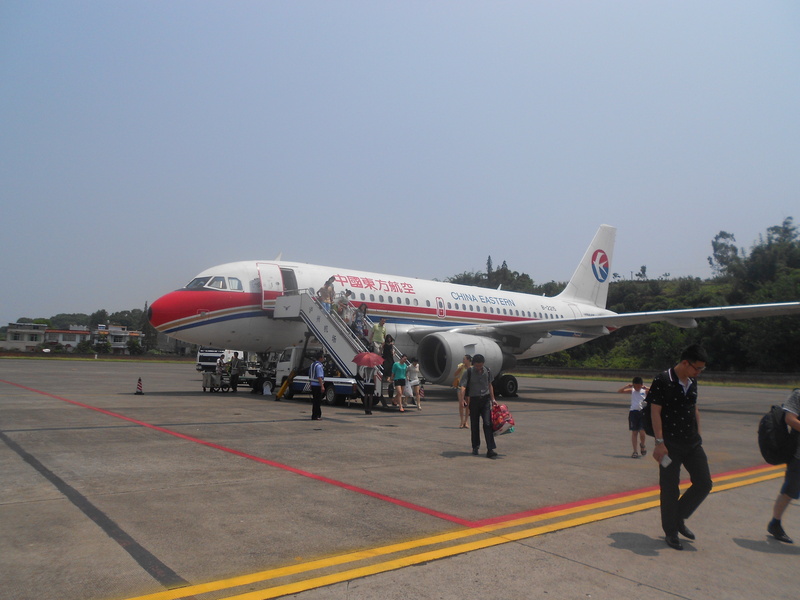 My own experience of flying in and out of the Luzhou airport wasn’t quite as moving but knowing a bit of the history did give me a twinge of great respect and pride in the Chinese people for such an accomplishment. While small, this airport certainly deserves to be noticed and written about, if only via my little article published here. Until next entry, here’s wishing you Ping An (peace) for your day. 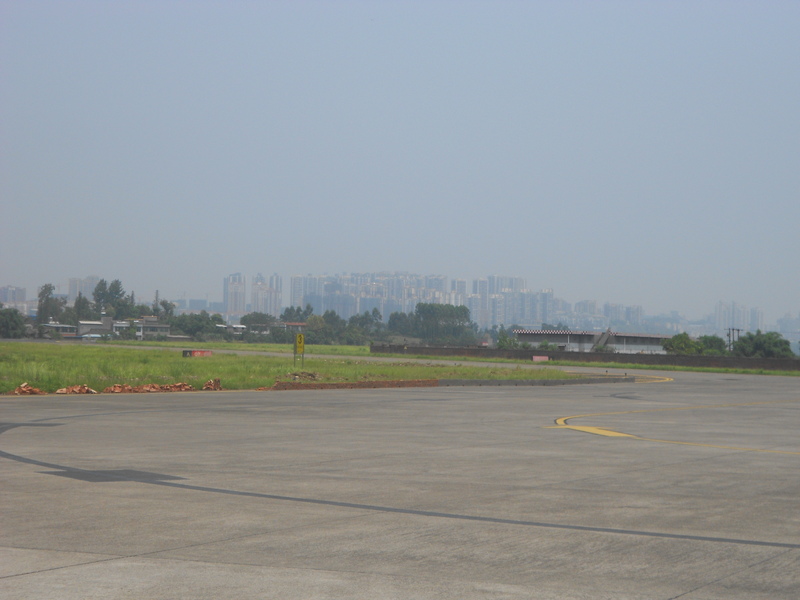 The first “real” runway built in China, with distant Luzhou in the background. While restored many times, the foundation has remained as it did over 70 years ago.